There are few creatures as fierce and frightening in appearance as cerberuses. These giant beasts are exceptional fighters, because they have not one, but three heads. Each of these heads is capable of independent thought, making cerberuses formidable adversaries. The hot flames these companions breathe also add to their reputations. The soulflame cerberuses, with their blue markings and brilliant colors, create the hottest fires. Hellflame cerberuses, which are orange in color, do not produce such hot flames, but are slightly kinder. Many think these companions come from fiery caverns under the earth, as their heads are nothing more than smooth bone. No one knows for sure, but it is true that their appearances are frightening. It is a chilling sight to see a cerberus bring down prey, because they do so with a burning stream of fire, cooking their meal as it attempts to flee. Though cerberuses eat a variety of foods, they constantly crave meat, and leave The Keep often to pursue prey. Because of this powerful desire, it is very important to teach a young cerberus not to prey upon nearby herds, or the farmers will become very angry. Luckily these attacks have ceased, as the cerberuses have become even more illusive. These creatures are extremely rare to spot in the wild, because they actually live inside active volcanoes. It is thought that there are tunnels under the ground, leading to mysterious, perhaps evil lands where the cerberuses roam. No magi has been able to investigate these myths, as no human can make it past the streams of lava. Southeners believe the cerberuses guard the very gates of hell, allowing only the dead to pass. This egg is burning hot to the touch, and the striped tail emerging from it whips wildly back and forth. This hatchling has a hot temper, and must be watched carefully, otherwise it may injure other creatures. 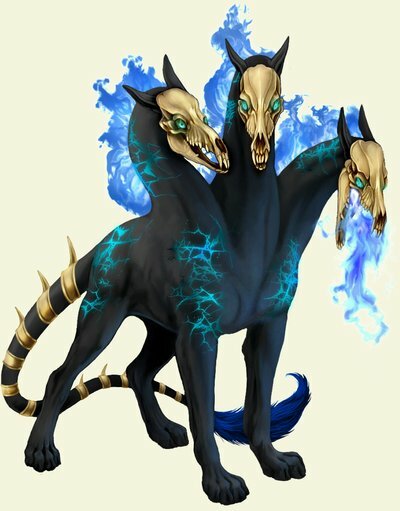 Any magi with a cerberus puppy as a companion must take great care to exercise the hatchling enough, or the young dog will have too much pent up energy. Cerberus young must also be taught from an early age to only play with other cerberuses. Their strength and eventual ability to produce flame could harm other companions very easily. Luckily, cerberuses cannot be hurt by heat or fire, and can play harmlessly with one another. An amusing example of this power can be seen at the midsummer celebration. Every summer, the magi collect all the sticks and branches from the fields, and create a huge bombfire. The magi have a gathering and roast various foods, but the cerberus pups are more interesting in romping through the coals and flames. Born the size of regular puppies, these creatures grow quite rapidly. They devour everything in sight, particularly meat, with their need for energy. A fully grown cerberus can reach the height of a man's shoulder, making training of the utmost importance. If raised gently enough, a cerberuses savage nature can be somewhat soothed, though fights with other companions break out from time to time. Cerberuses never snap at humans, however, and are some of the most loyal companions there are. A cerberus would sacrifice its own life to save that of its magi, and there are many stories about such events. These creatures cannot burn, and most animals cannot threaten them with size, so the most common deaths they face are those by cold or water. They leave for the south in the winter, but water is a constant threat. Cerberuses fear and loath the water, and if they venture into it, their ethereal flames will die out, leaving them cold and broken. Even the smallest cerberus puppy knows better than to venture near water. Pups are somewhat rare in the castle, as tame cerberuses never show any interest in taking a mate. No one has ever seen a cerberus mating take place, nor have there been any eggs produced at The Keep. Scholars hypothesize that these dogs do so deliberately, so that they remain in control of their population. How many dogs exist in the lands under the southern volcanoes, one can only guess.